We are honored this week to be able to have Lacey Neher as our spotlight person of the week. In case you don't know Lacey she is a very great person who gives a lot of her time and energy to the WMMA community and always has something uplifting and positive to say. She is also responsible for some of the great WMMA videos that you might have seen on the Internet so without further a due we would like to present our spotlight person of the week Lacey Neher. Lacey: My name is Lacey Neher (pronounced near), I am a 36 yr old Wife and Mother. My Husband works full time as a Law Enforcement Officer and I work in the home taking care of our 3 children. I grew up In a farming community in rural Indiana and I still live in rural Indiana. (just not on a farm) I met my Husband Keith while we were working at the same factory back in th 90's. We were friends at first but a spark developed along the way and we've been together ever since. I have an education in early childhood education and I worked as a preschool teacher for over 7 years before deciding to stay home with my children, who are now 6, 3 and 2. MMA is easily my fave sport overtaking football which I almost never watch anymore. Because I stay at home most of the time, the computer has become a way for me to link up with the outside world. Through facebook and other social media outlets I became more into MMA because of the availability the internet gave me to the sport, it's fighters and fans. Lacey: I was an athlete in school playing volleyball, basketball and track, but in my community access or even the thought of participating in a martial art wasn't really available to me. Now, with the popularity that MMA is bringing to martial arts more Dojo's are springing up in the small town we live close to. But, alas I'm sorry to say, I haven't studied a martial art. (hope I don't lose any cool points for that!) I do respect the various disciplines but, I haven't attended a Martial Arts class ....yet. But, you never know, the interest is definitely there and my husband and I have discussed at length signing the whole family up. Lacey: My Husband originally introduced me to MMA and I would sit and watch it with him as a way to spend time together. Then, I fell in love with the sport. The competition the athleticism and the entertainment value had me hooked. I started the Facebook page Real Women watch MMA over a year ago because I wanted to find other women who followed the sport like myself. I haven't been disappointed. I was also surprised at the amount of men that have joined. That's why I added the "and Men" to the title. 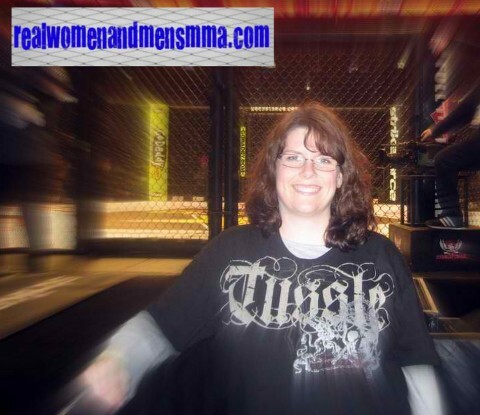 I started the website realwomenandmensmma.com as an offshoot of the Facebook page. It's dedicated to MMA in general but, I pay special attention to Women's MMA. Because of RWWMMA I have become a part of a community, the MMA community, and it's a pretty awesome place to be. I began to take an interest in Women's MMA more so than the mens because I find the strength and determination that female fighters display is far more interesting and inspiring. Men's MMA is everywhere and female fighters work just as hard if not harder than their male counterparts and the lack of recognition they were receiving for that hard work was and is infuriating. I've said this before, The Women ALWAYS bring it. You never hear too many boos during a female fight for lack of activity. They go into the cage to fight to win. So many men's fights these days are two fighters doing everything in their power to "fight not to lose" for fear of being cut or knocked out. So, wanting to do all I can to help the women get more exposure was a no brainier for me. Don't get me wrong, I love to watch the men battle, but my heart is with the WMMA. I write about both men's and women's MMA but, I find it easier and more inspiring to write about the ladies. I've always been a creative person in some capacity; I've acted in Plays, I've been a wedding singer, an avid photographer..etc..etc.. When I got a new computer about a year ago and I found it had a movie maker I thought to myself, "There are thousands of HL videos featuring men's MMA out there. I could mesh my love for women's MMA and my need to be creative, by making videos spotlighting Women's MMA." I hope my videos can make at least one person who thinks that women should stay out of the cage to rethink that opinion and see that they deserve just as much exposure and respect as the men. Lacey: Easy! 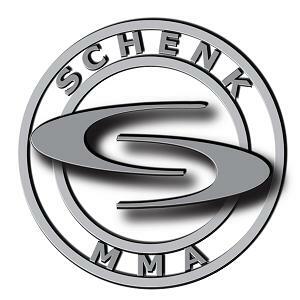 I follow SchenkMMA because of a mutual admiration for the sport of MMA and the WMMA in particular. SchenkMMA is a great website and advocate for women's MMA. I'm still more of a Facebooker but, I have RWWMMA linked up to twitter and I am finding myself tweeting more everyday. Lacey: Shout outs: To my gorgeous and courageous Husband of almost 10 years, Keith and our 3 kidlets, Luv ya lots! To My "Mommila" for always having my back. To Sam Wilson for her selfless time and dedication she puts into the sport and for being an awesome friend. To Katrina Belcher from the ultimatefemalefighter.com for inspiring me to write about MMA and for putting up with a novice when I first started out. To Angel Rafael Candelaria of The MMA Truth for being one of my biggest cheerleaders. To Mighty Mia for showing me that you can live beyond the limits your body puts on you and to live each day like it's my last. To everyone in our awesome group of WMMA Advocates! What a great bunch of people who have put their egos to the side to band together for a great cause like Women's MMA. To all who support Real Women and Men who Watch...and DO and LOVE MMA! To you! Thanks so much for including me in this series. What an honor!